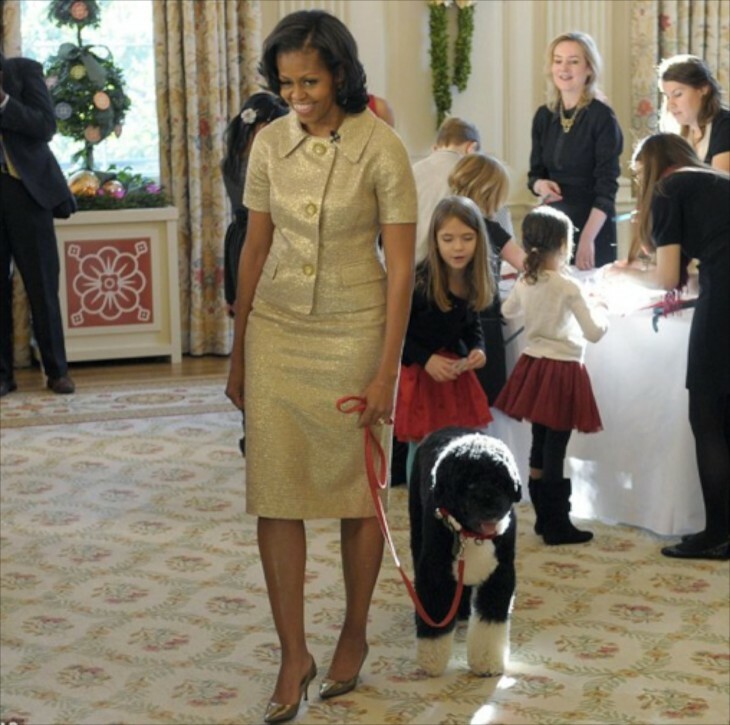 The White House is the people’s house, and it is made all the more relatable because two children and now two family dogs live there. It is a lively and happy place to be, especially when Christmas rolls around. 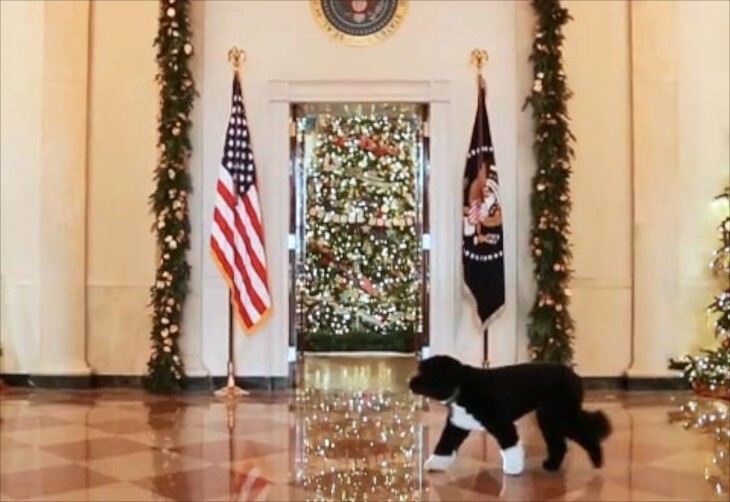 I thought it might be fun to see a little bit of what it takes to put together a White House Christmas, along with some interesting behinds the scenes information, with First Dogs Bo & Sunny taking center stage. 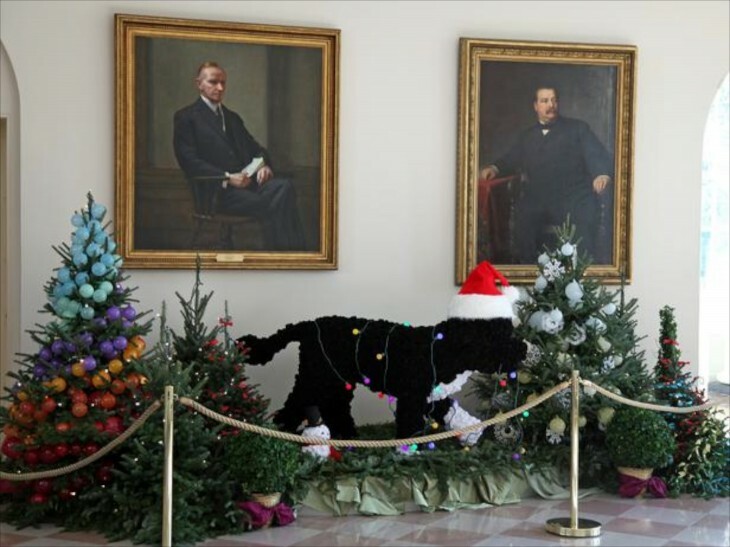 There are many enduring decorating traditions in the White House, including many of former President’s pets up front and center. 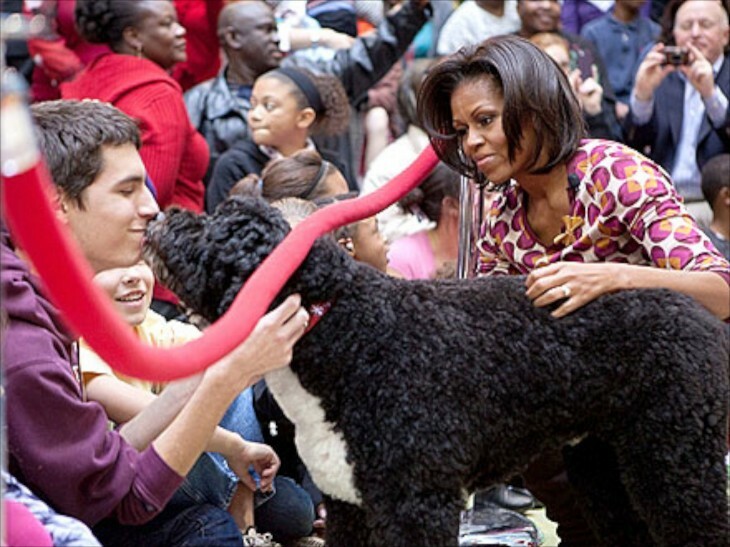 Bo has been very, very popular, especially with children. 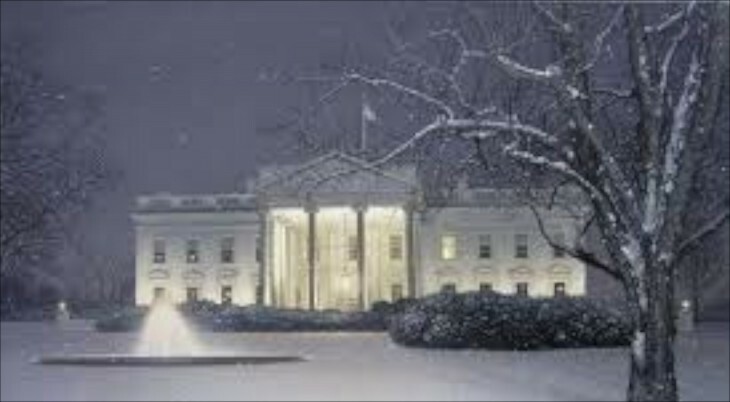 The White House in Winter. It is quite lovely, isn’t it? 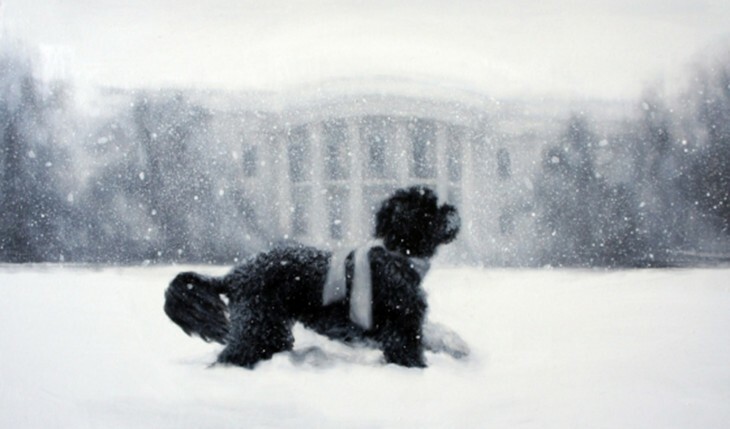 Bo frolicking in front of the white house during a blizzard. 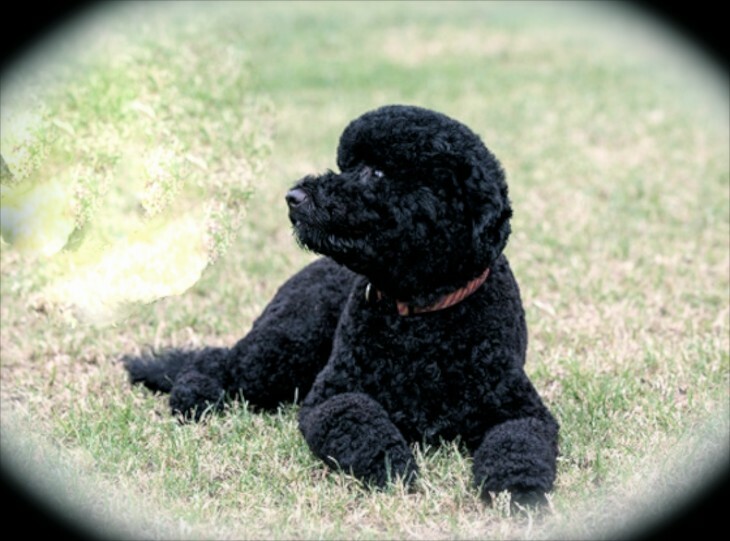 Bo is a natural therapy dog……. 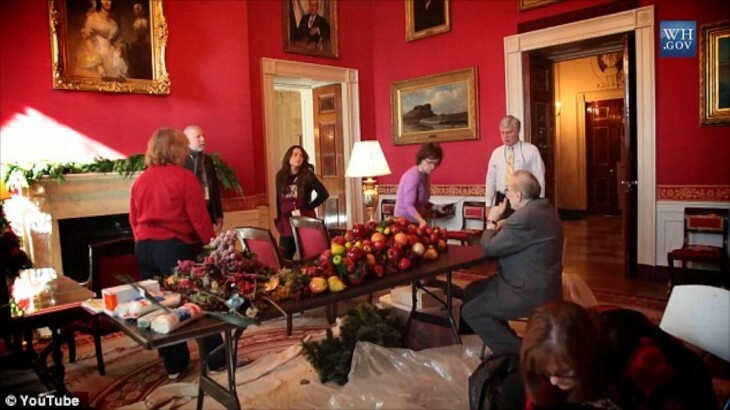 Here Genevieve Gorder, from 2011 was checking that all is ready for the holiday decor reveal. 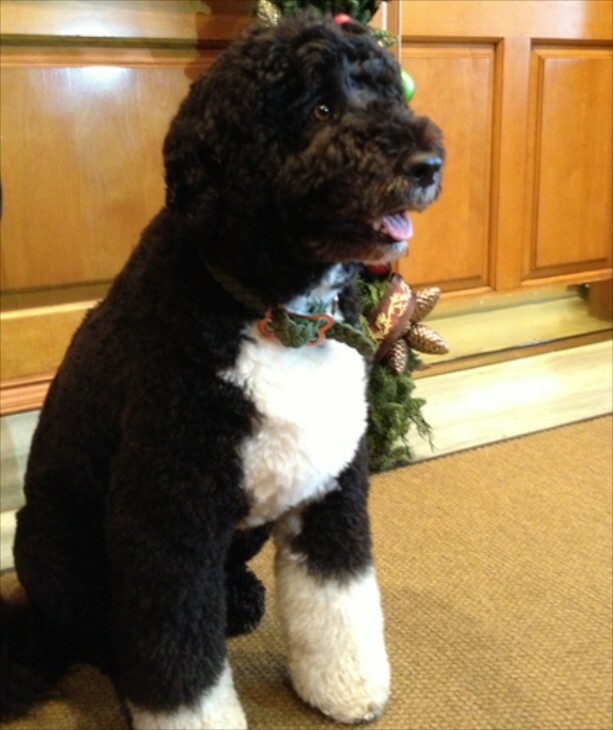 This summer the President’s family added one year old “Sunny” to the family, stating that Bo needed a canine playmate. She arrived from Michigan and apparently fit right in. 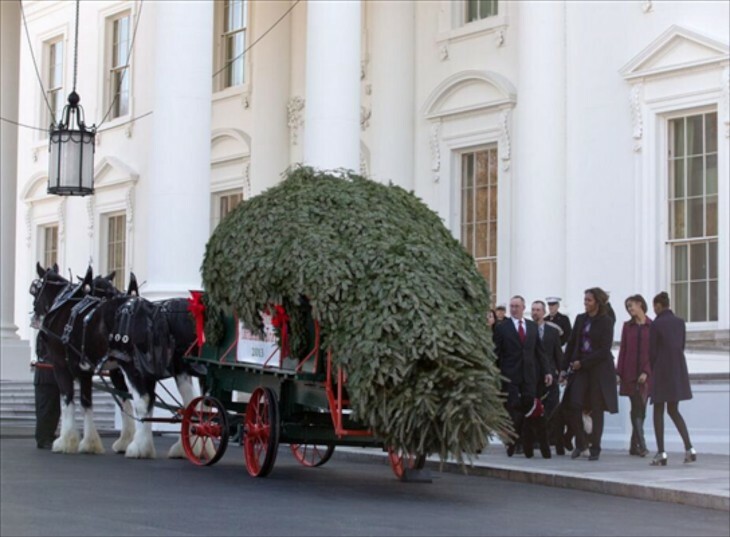 The official arrival of the 2013 Christmas tree in front of the White House. This year it came from PA. I love how it arrives my horse drawn wagon, another tradition. Bo guarding it until it is moved inside. This year there were 85 volunteers from 30 states. They pay all their own expenses, including airfare and lodging. 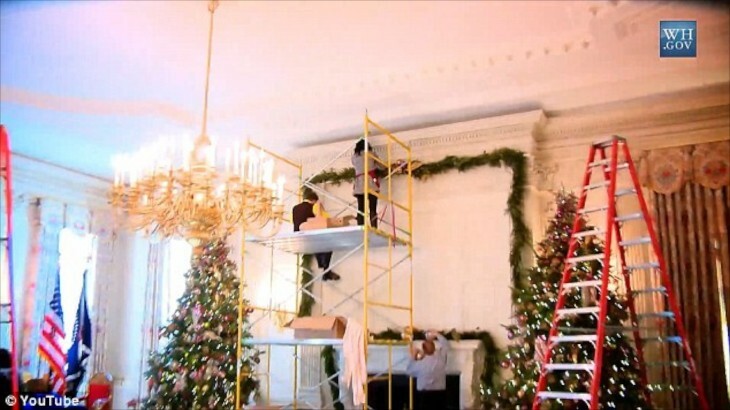 Tall ladders and scaffolding are needed to complete the task of decorating the trees, mantels and tables. Of the 85 volunteers, 16 were either members of the military or of their families. They came from 39 states, with one coming all the way from Hawaii, the President’s home state. It is an immense task. 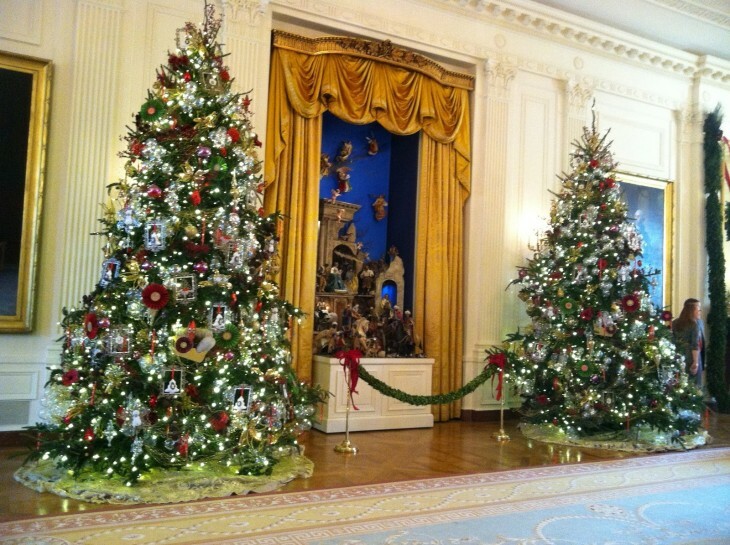 There are 54 trees around the White House, with 24 visible on the public tour. 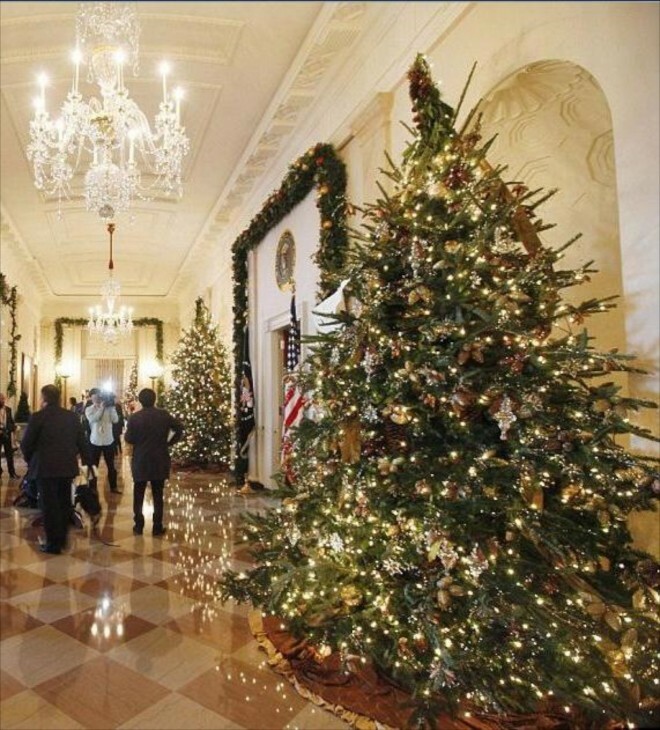 Visitors see these trees in eight of the decorated rooms. This year they are expecting between 70,000 & 90,000 visitors. 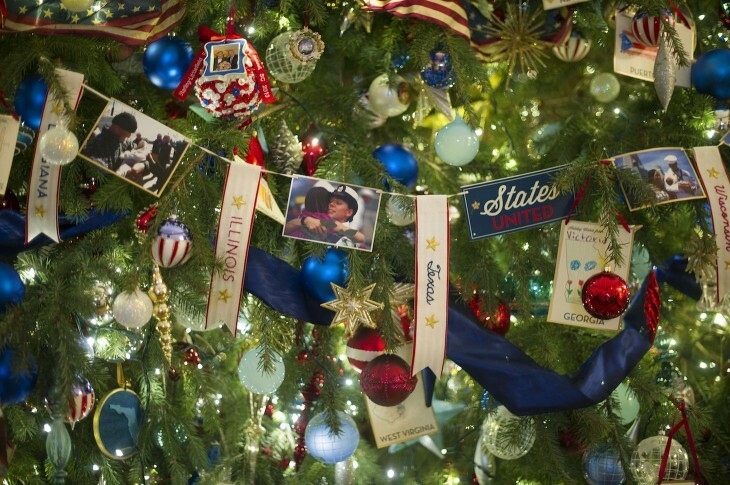 As is customary, the military families are honored in many of the trees. 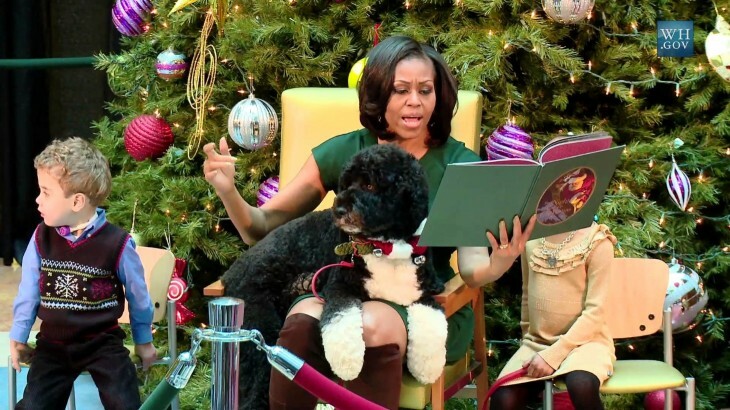 First Lady Michele Obama is seen here with Bo reading “T’was The Night Before Christmas” to children at Washington’s leading children’s hospital. 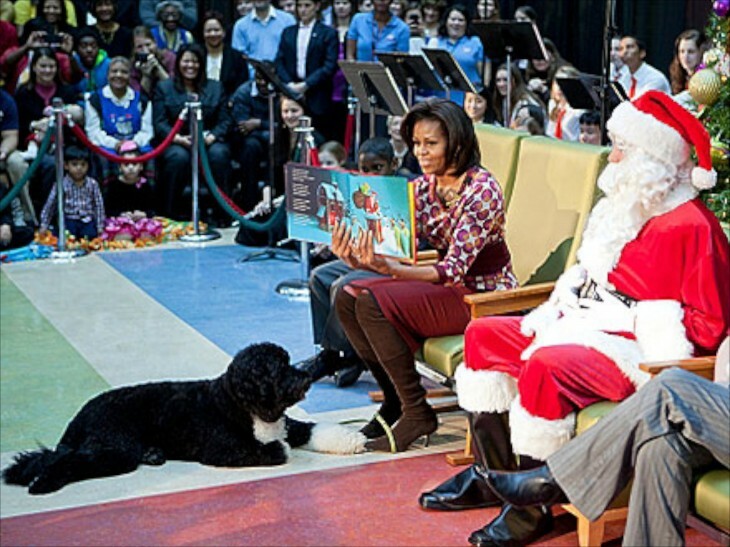 She first visited privately with children who will unfortunately have to spend their holiday in the hospital. She began reading with Bo contentedly at her feet. 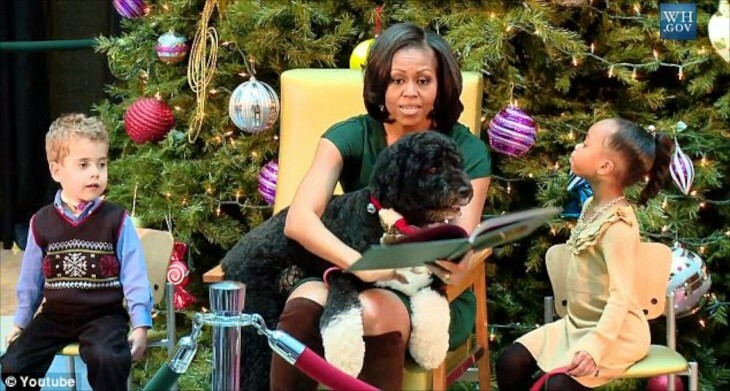 Bo then moved on his own into her lap for the rest of the story. There are more photos that showed the little boy on the left who then moved in closer, and throughout the reading of the story pet him the entire time. 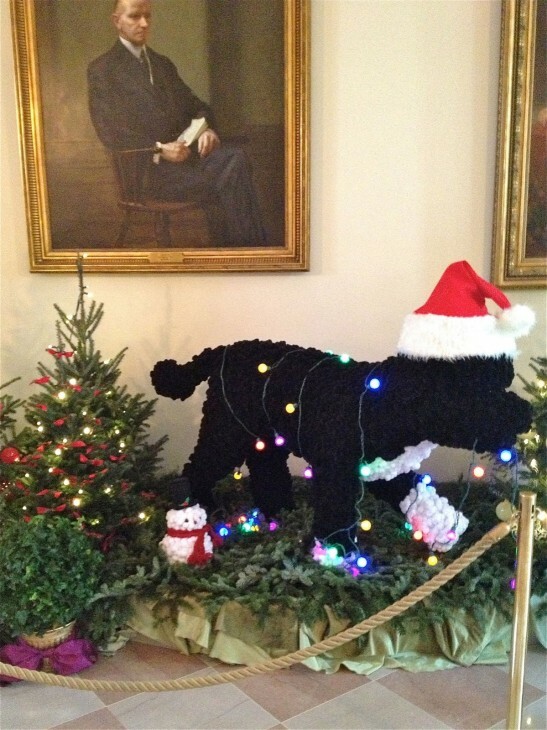 There are oodles of “Bo” ornaments throughout the WH and on the trees, such as this one made entirely of buttons. Here he sports a Christmasy collar. This is a very well trained and sweet boy. 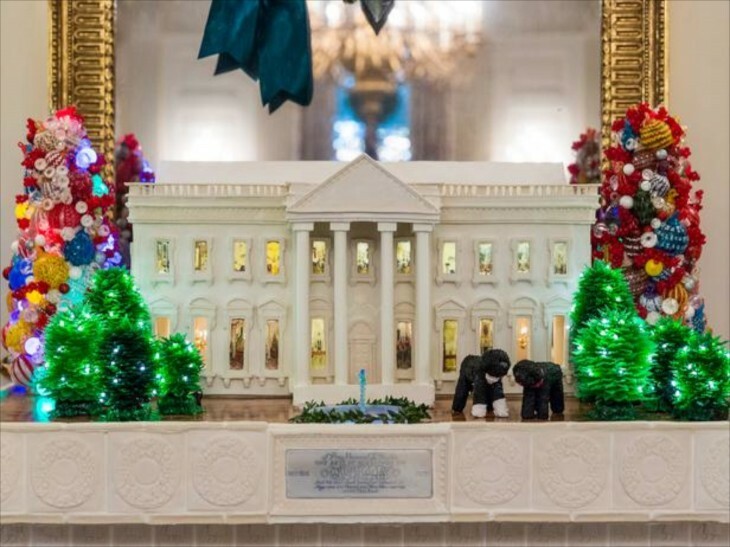 Gingerbread houses are also a tradition, and the White House bakers always step it up a notch with their beautiful and wondrous creations. This one is made and covered in white chocolate, with Bo & Sunny visible and sweet chocolate confections. 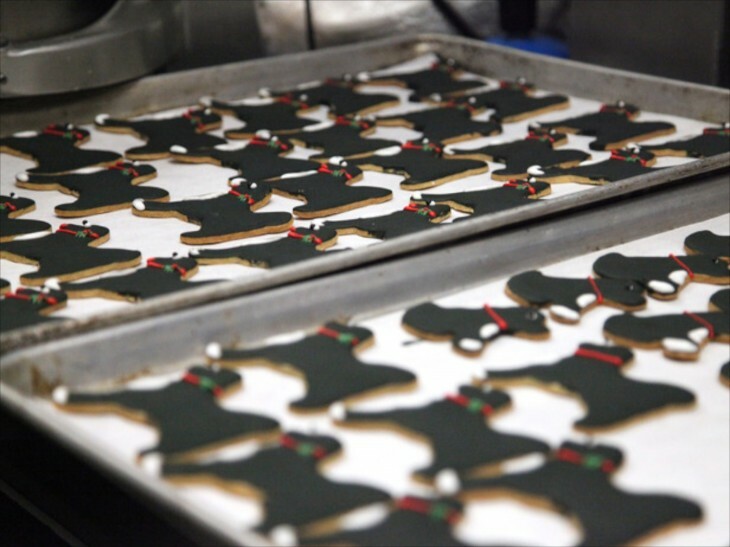 Cookies are a huge part of the parties and celebrations that the First Family hosts during the Christmas Holidays. 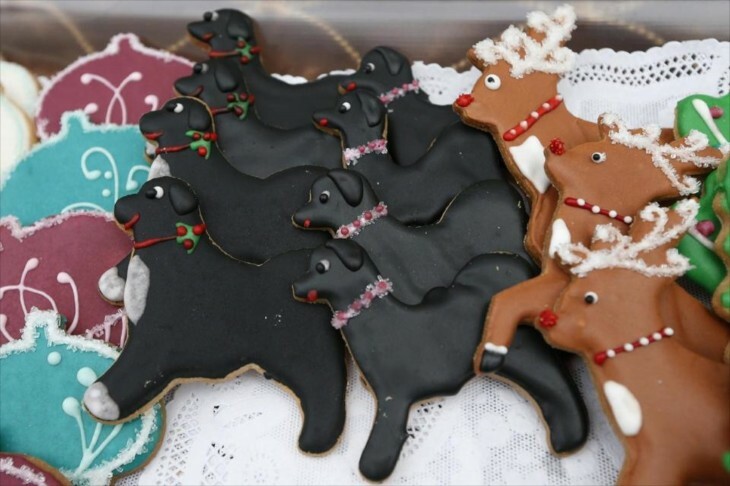 Among the many reindeer and xmas trees are cookies in the likeness of the two First Dogs. 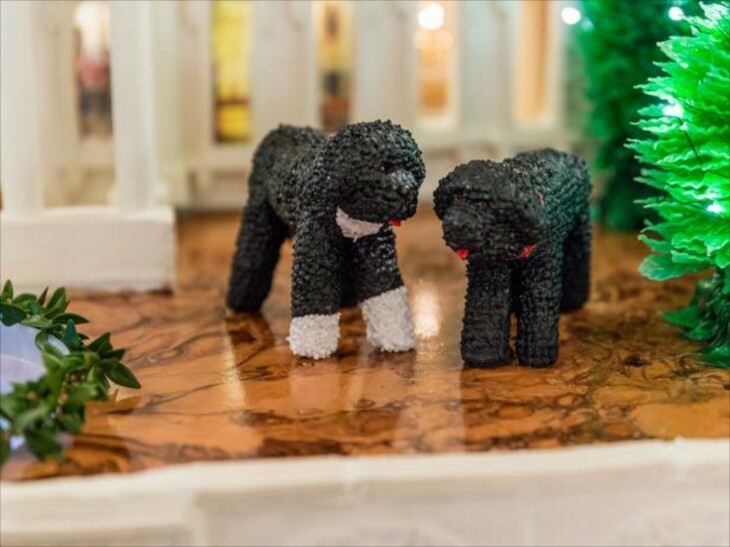 Here is a closeup of the two dogs in front of the gingerbread house. Love the pink tongues. 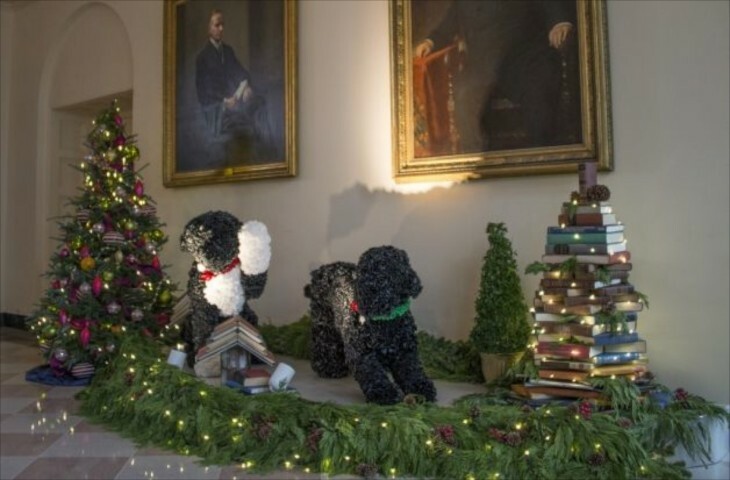 Hundred’s of books were used in the decorations this year and after the holidays they are donated to various charities. 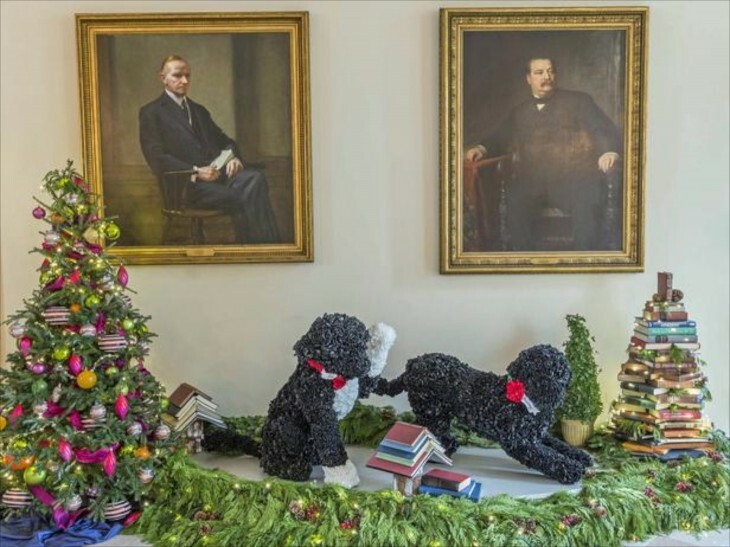 I have had a few incidents myself of my Newfoundlands getting caught up in the ornaments and lights in their effort to “help” decorate the house and trees. 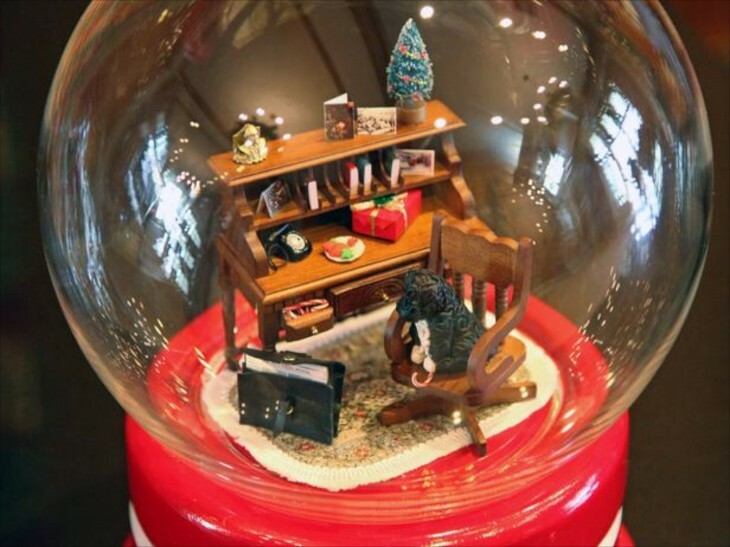 Around the White House are snow globes, which I have adored since my childhood, and some like this, with a likeness of Bo inside. 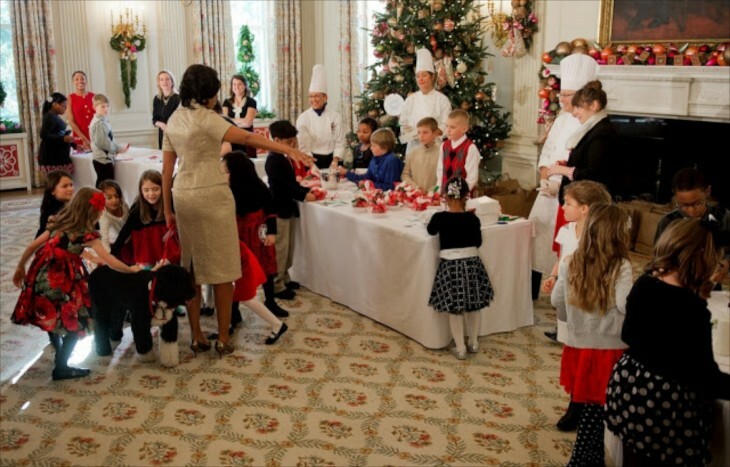 Looks like he got ahold of a candy cane…..
Bo at one of the public functions. 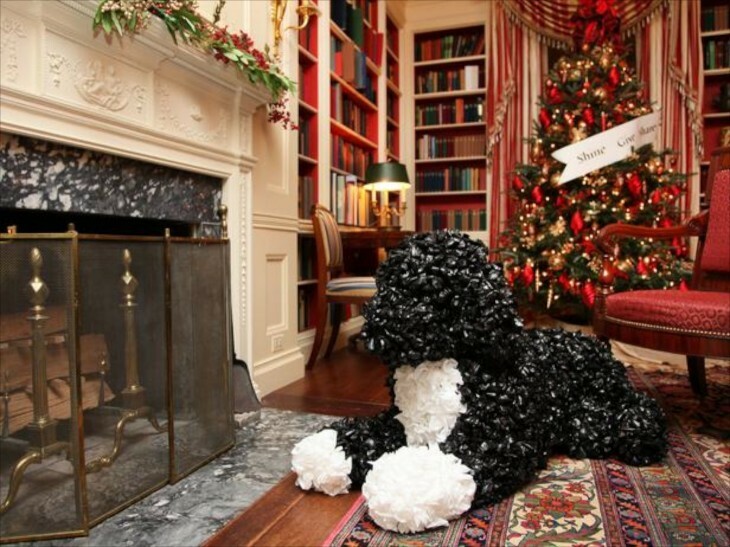 This is a bigger than life-sized Bo, made entirely out of trash bags. 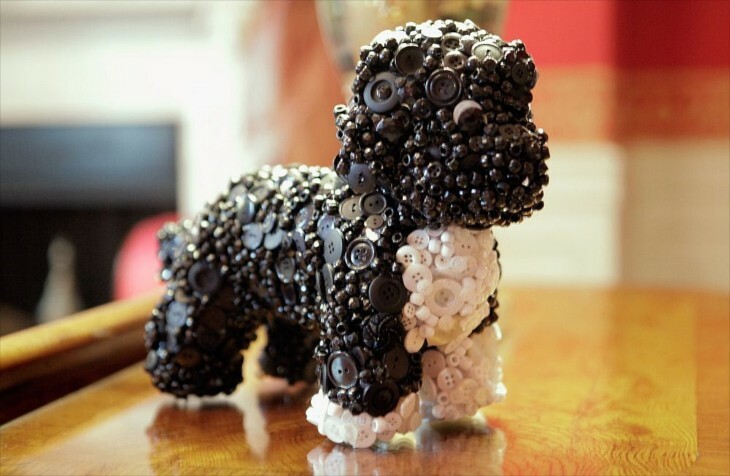 Another Bo likeness, this one made of pom-pons. 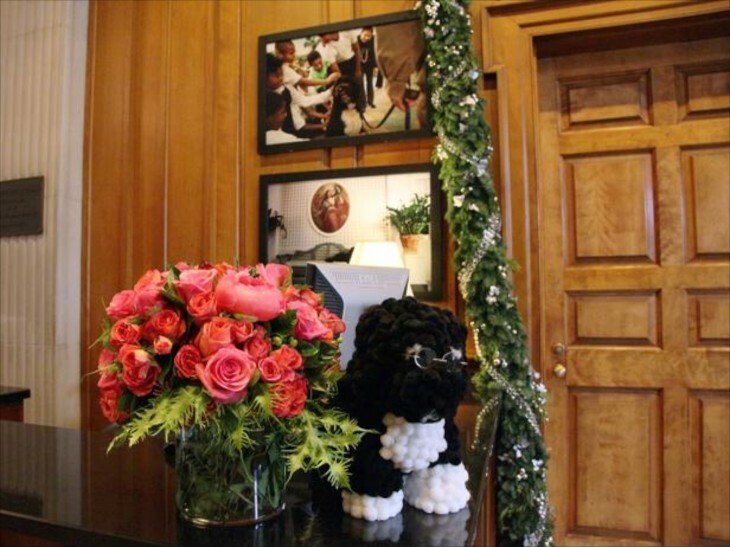 Notice the photo on the wall of Bo with children, who can’t get enough of him it seems. 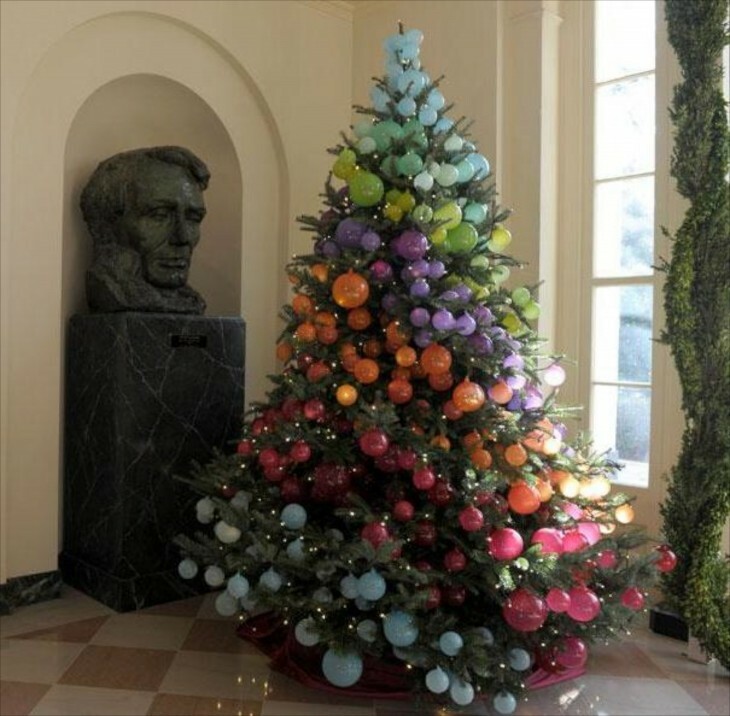 The main tree this year is a Douglas Fir and is located in the Blue Room. It is 18 1/2 feet tall and 10 feet wide. 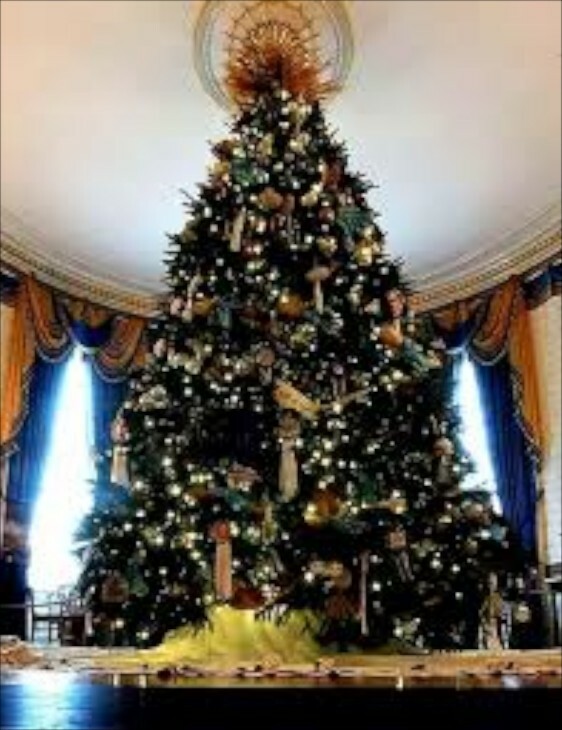 There are more than 2,000 distinct ornaments, from all 50 states, made by military families, on this main tree. Some are photos, some show memories, but all honor the military. A view from the hall, lined with a parade of beautiful trees. The volunteers are amazing! 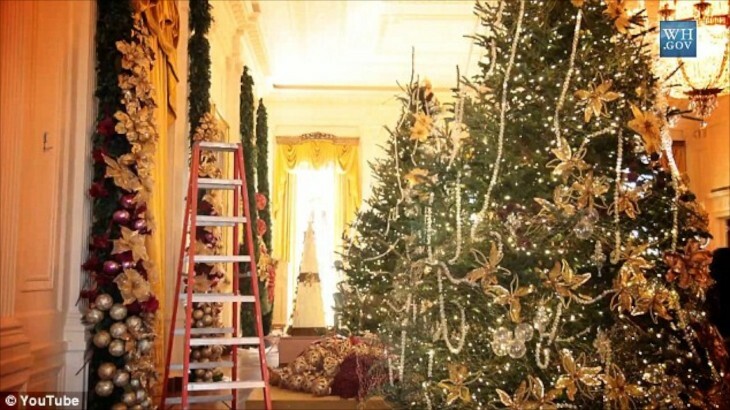 Can you imagine the sheer number of ornaments? And the strings of lights……ooooo, I do not enjoy stringing lights. A bit out of the ordinary, but festive as well. When the light streams through the window, I bet they glow. 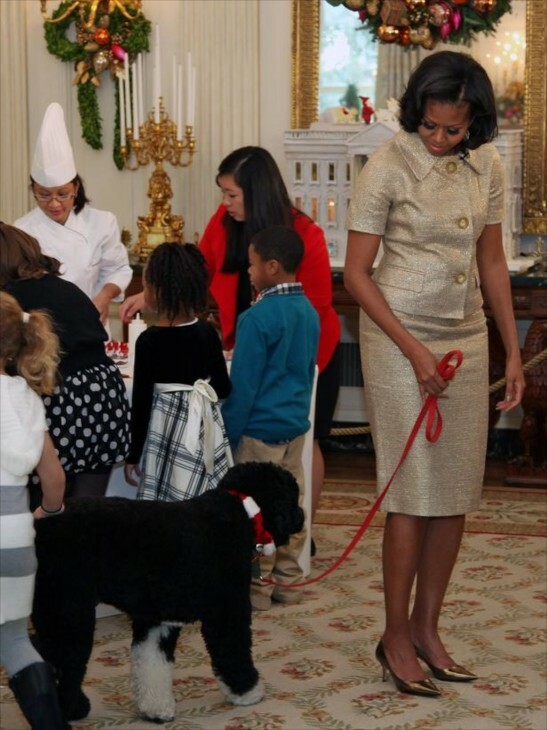 See the little girl behind the First Lady trying to coax Bo to turn around? It worked! 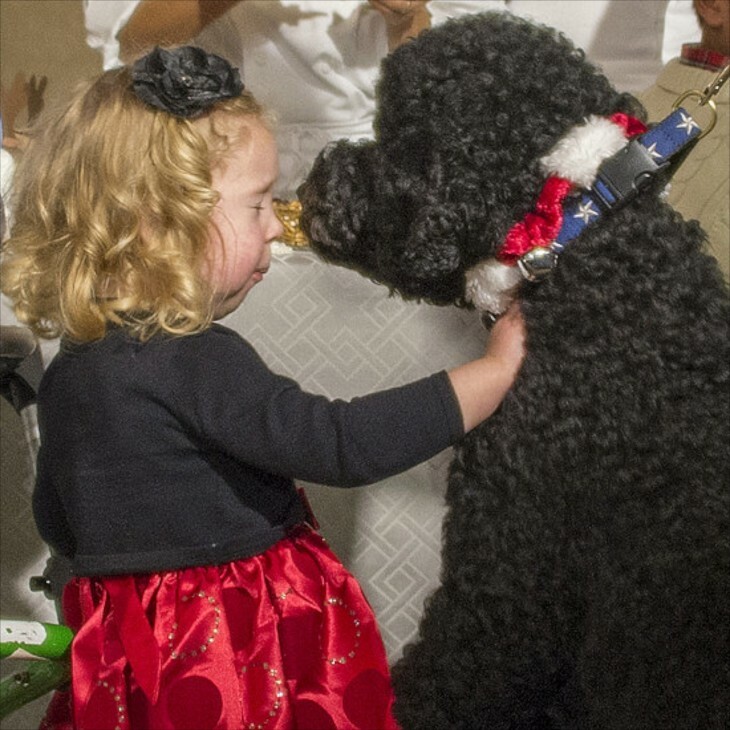 I wonder how many children leave the party and add a dog to their wish list? 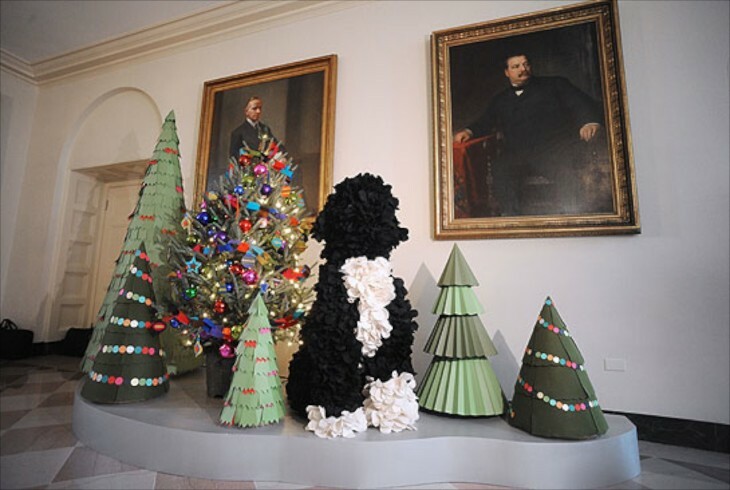 The volunteers strung more than 20,000 pom-pons to make many of the “Bo” decorations. Here is Sunny apologizing – she had just given her a kiss. She and this darling little one gently collided and she fell. 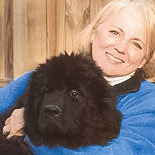 But she got right back up to continue to love on Sunny. Looks like Sunny is a natural with children just like her brother Bo. This gives you an idea of the scale of some of these large decorations. 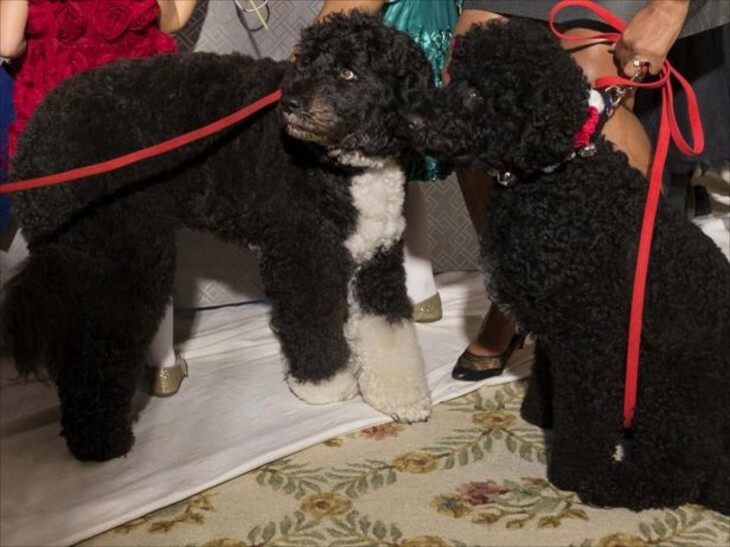 I couldn’t find out what this one was made of, but it sure shows the curls of both dogs coats. 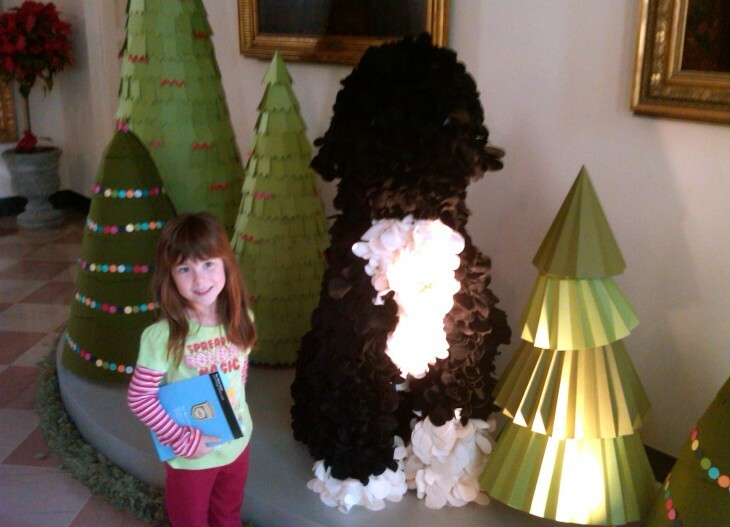 One of the lucky visitors has her picture taken along side the Bo stand in. 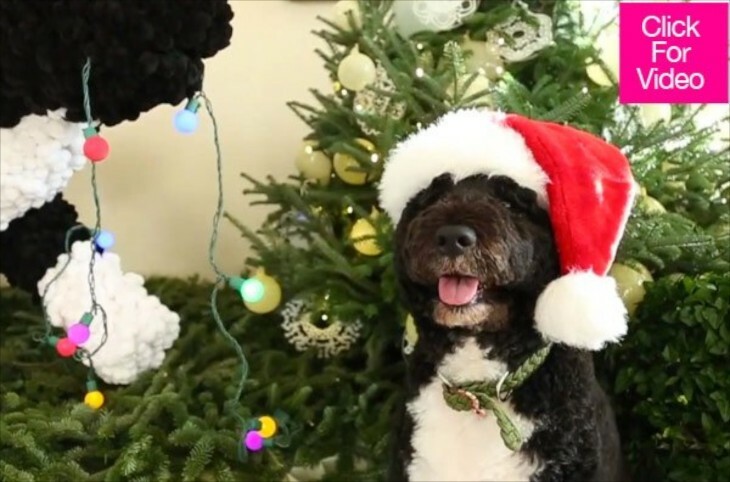 My Newfs have been my only dogs that would allow me to put a Santa hat on. Bo seems quite comfortable as well. The designers did a great job of capturing the playful positions of dogs in motion. 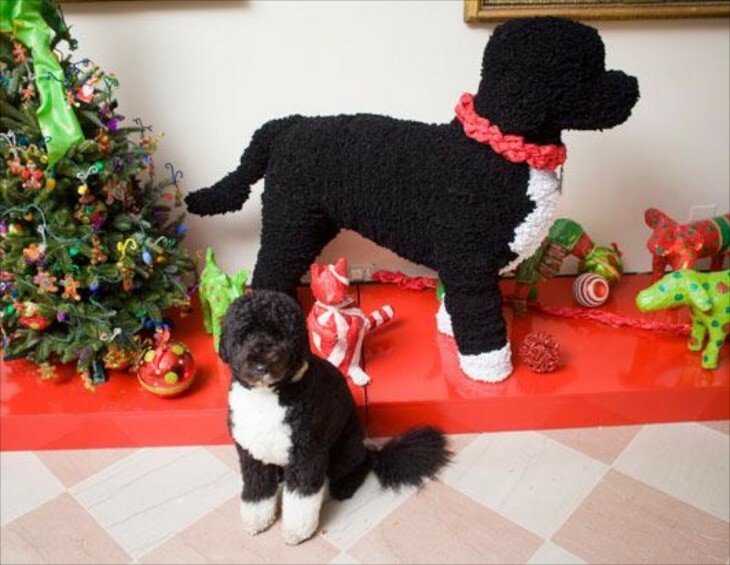 Bo dwarfed by his own likeness. 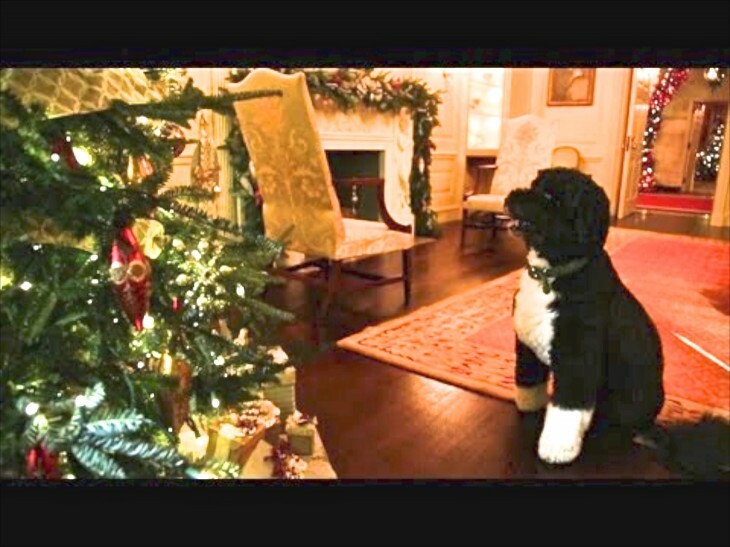 Most dogs are fascinated by the lights and ornaments on a tree. Cats act on it, but most dogs are pretty good. 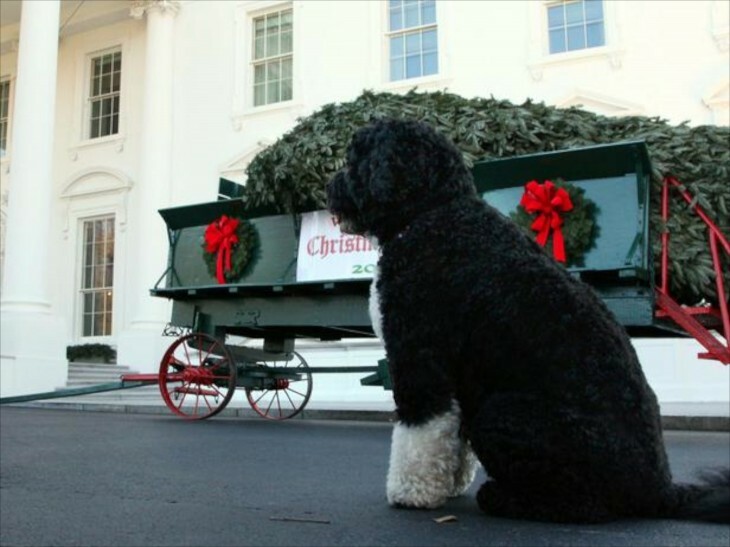 Bo pretty much has the run of the place…..not a bad job. 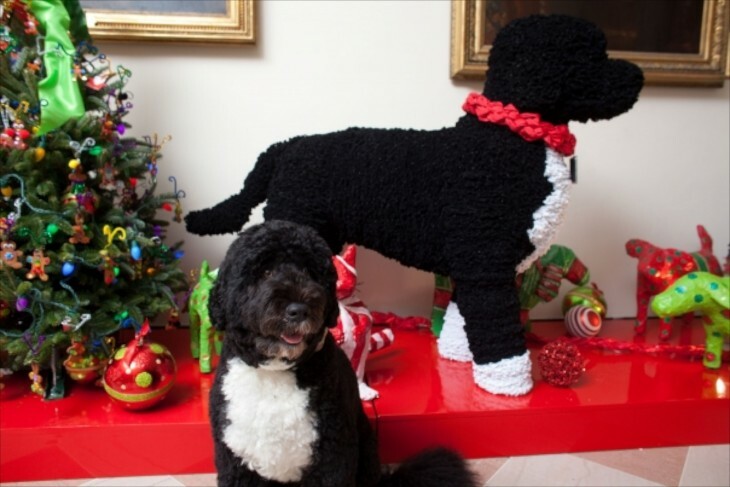 This is this years official White House Christmas card. 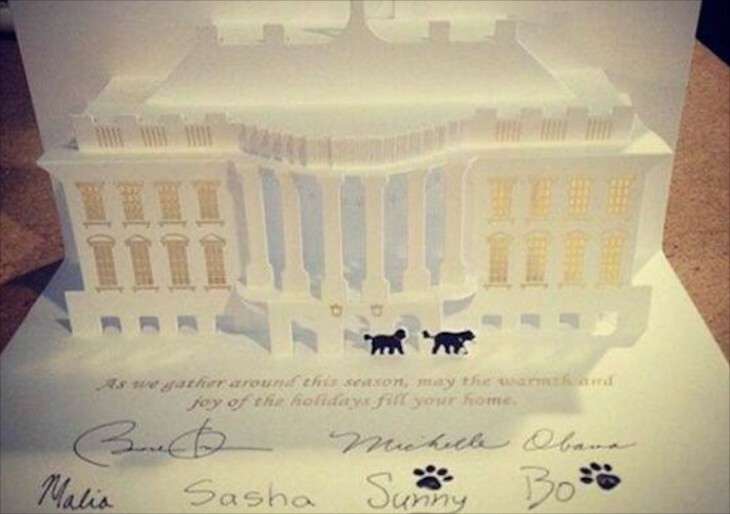 I really enjoy appreciate paper cut out pop up art and this one, with the two dogs out front is sweet and elegant. To all a Merry Christmas and to all a good night! 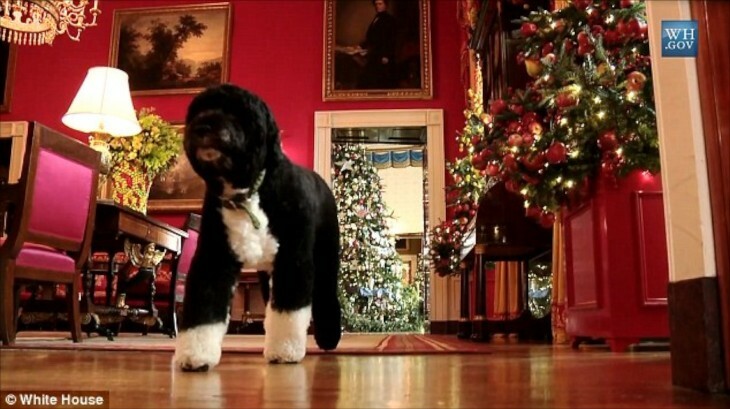 There is a darling video of Bo, I believe from last year that was released by the White House, that shows all the holiday decorations in the White House. Check it out below. The second video is of Bo & Sunny meeting…..makes you smile at their joy in simple play. Dogs teach you that. Love this tour. The dogs are spectacular! Merry, Merry Christmas , Charisse. It’s been a great year “traveling” with you on your website! Thank you…this blog, in it’s very short tenure, has been interesting, challenging but fun. I look forward to next year and sharing of a lot of fun projects, home tours and a few more “new” additions. Happy Holidays to you and Robert.